Best Sarasota fishing charter is Adventure Charters! The best Sarasota fishing charter is Adventure Charters with Capt. Jim Klopfer. Capt. Jim has been guiding in Sarasota full time since 1991. Diversity is what makes Capt. Jim different from all the other fine guides in Sarasota. He will employ multiple tactics using both artificial lures and live bait on a single four hour fishing charter. Sarasota offers visiting anglers many different species to target and catch and several different techniques with which to do so. This is advantageous as it allows Capt. Jim to tailor the fishing charter to the experience skill level and expectations of the client. Depending on the season, most fishing charters produce 6 to 8 different species. Speckled trout, snook, redfish, Spanish mackerel, blue fish, jack crevelle, flounder, sea bass, grouper, snapper, sheepshead, flounder, black drum, false albacore, sharks, ladyfish, cobia, and even giant tarpon are available throughout the season. Tackle used on the best Sarasota fishing charter is very similar to what freshwater anglers are comfortable with up north. A 6 1/2 foot spinning outfit spooled with 10 pound line is used on most charters. Heavier tackle is used when targeting large fish such as snook or when fishing around docks and bridges. Capt. Jim can provide conventional tackle for those anglers who prefer that. Fly fisherman are certainly welcome, Capt. Jim provides Orvis tackle for his clients. A seven wt to 9 wt weight outfit with an intermediate sink tip line is a great all round choice. The majority of charters are run on the deep grass flats in Sarasota Bay. The Bay is blessed with large expanses of submerged vegetation and water ranging from ankle-deep to 10 foot. The best action comes on the flats that are between 5 feet and 10 feet deep. This is where the most variety of species will be encountered. Anglers will cast lures or live bait as the boat drifts across the flat. Both Big Sarasota Pass and New Pass are inlets that connect Sarasota Bay with the Gulf of Mexico. Both can be very productive depending on the conditions. Spring and fall are prime times to fish the passes. Pompano, bluefish, mackerel, and ladyfish are commonly caught in the passes. Structure such as docks, bridges, seawalls, and rocks provide prime habitat for several different species. Sheepshead, grouper, snapper, flounder, and snook are all caught around such structure in the passes at one time of year or another. Fishing can be fantastic in the Gulf of Mexico, just off the Sarasota beaches. Spanish mackerel, false albacore, and other species move in to feed on the huge schools of bait fish. A couple days of east wind will result in calm seas and clear water. This brings the bait in which in turn attracts the predator fish. Sharks, king mackerel, cobia, and even tarpon are also landed. This truly is world class fishing! Anglers seeking a bit more challenge may opt to target snook, redfish, and jacks. These fish are seldom caught by accident. Mangrove shorelines, oyster bars, docks, and potholes in grass flats throughout the area are prime locations for these game fish. Artificial lures such as plugs, jigs, and spoons are most often used. This type of fishing won’t produce the numbers of fish that the deep grass flats will, but it will produce some real trophies! 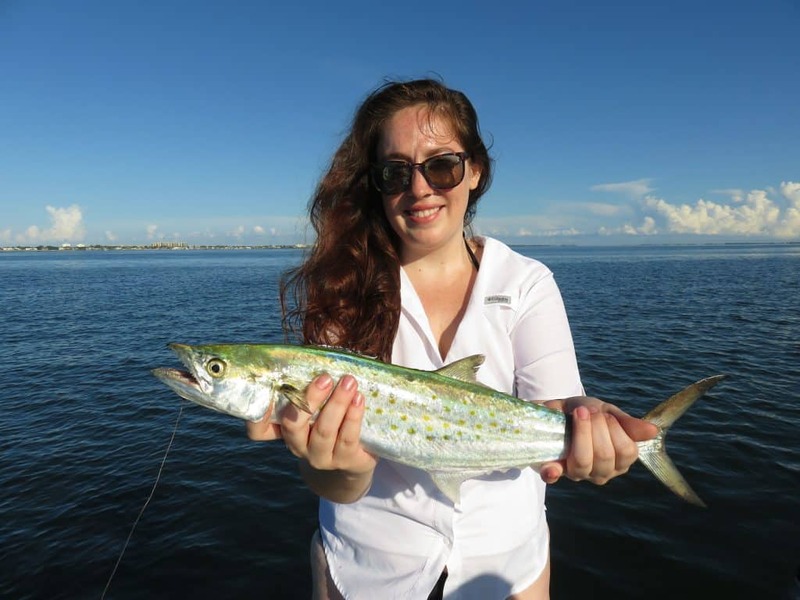 Many anglers going out on Sarasota fishing charters have a specific species that they would like to target. This is especially true of the “glamour” species. Snook, redfish, and tarpon are examples. 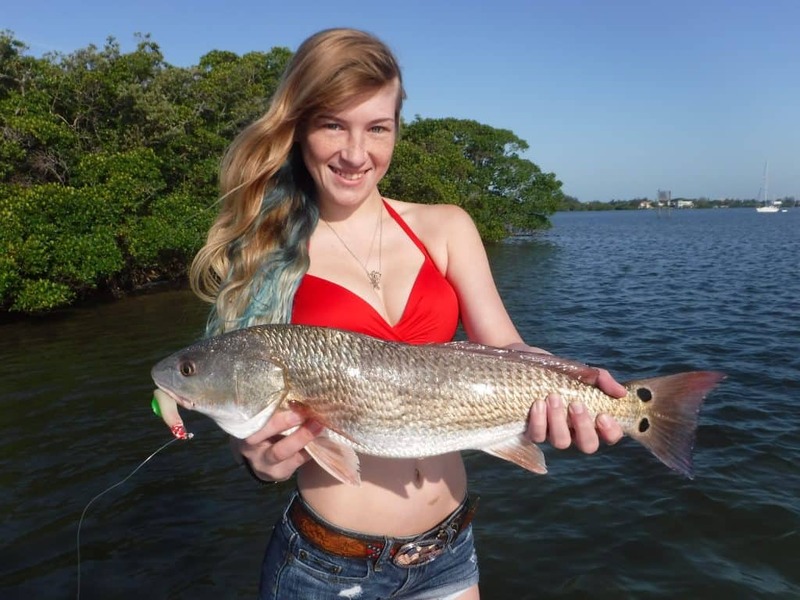 Below is a list of the most popular fish species available to anglers fishing in Sarasota. Species caught on the best Sarasota fishing charter. Check HERE for local regulations. 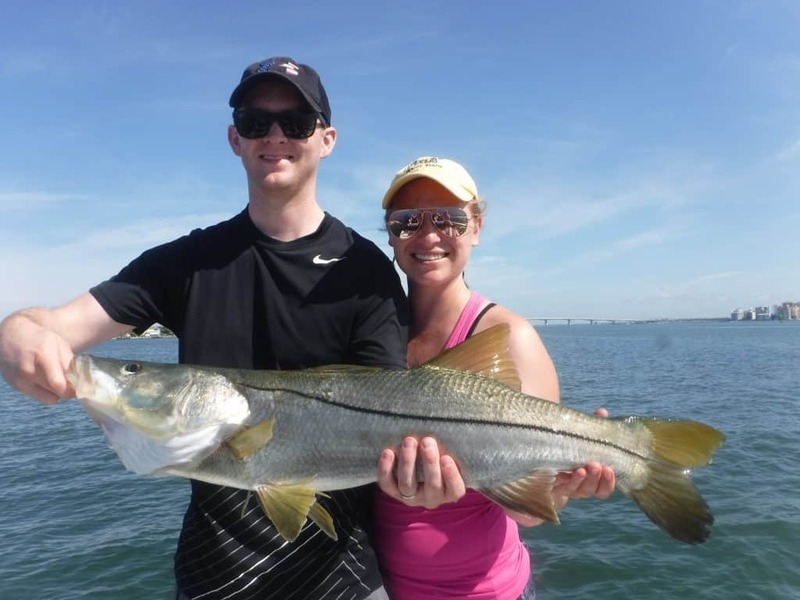 Snook are the premier inshore game fish in Florida, and are very much sought after by anglers in Sarasota. Snook can be caught in a variety of locations using multiple techniques. Snook are really a lot like largemouth bass; they are ambush predators with a large mouth that can inhale prey easily. They have a big broad powerful tale for quick movements in tight quarters. They feed on just about everything that swims and can be taken on live bait along with a wide variety of artificial lures. Snook have a very distinct seasonal migration. In the winter, especially if it is cold and the water temperature in Sarasota Bay dips into the upper 50s. Snook will migrate up into creeks and residential canals as the water in these areas is darker deeper and normally significantly warmer than the exposed shallow flats. Artificial lures are the best approach when targeting snook in these wintertime creeks and canals. Plugs and jigs with a soft plastic body allow anglers to cover a lot of water fairly quickly. It is important in this situation to eliminate unproductive water and lures give anglers the best opportunity to do that. Rapala X-Raps and Bass Assassin baits are proven lures for winter snook and jacks. As it starts to warm up and spring, snook will move out of their winter haunts and into the backwaters of Sarasota Bay. They will take up residence in ambush spots to feed. These can be mangrove shorelines with cover and a little depth, oyster bars that drop off, holes in grass flats, along with man-made structure such as bridges and docks. Current will position the fish where they can sit just out of the flow and ambush prey as it flows past. Generally speaking, outgoing tides are preferred, especially early and late in the day. Anglers fishing at night do well working the lighted docks and bridges with live shrimp and flies. The most effective technique for catching snook in the warmer months is to catch a bunch of pilchards, (also known as white bait, shiners, greenbacks) and use them to chum the snook into range and into a feeding mood. This requires a cast net, the ability to toss it, in a boat with a large live well and good pump. But in most cases, it is worth the effort! By the time we get to late May, many of the snook will be out in the passes and down the beach in large numbers. This is a time and place that snook spawn. It is a great time to catch and release a trophy snook. Live bait generally works best in the deeper waters of the passes. The rocks in Big Pass and New Pass hold a lot of fish. Anglers can also sight cast to snook a long area beaches. This is great sport and can be done with fly or light spinning tackle. By late August the pattern begins to reverse itself, and the snook begin moving back into the base. 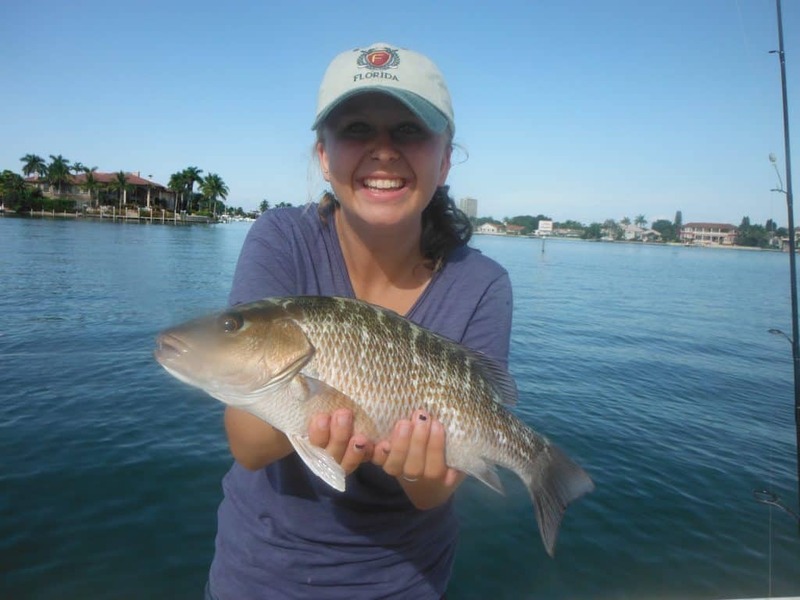 Redfish are another popular inshore game fish in Sarasota. Redfish are caught using two distinctly different methods. They are sought after on the shallow, expansive flats, primarily in North Sarasota Bay and around docks and other structure in cooler months. Redfish start to school up in mid-summer and the schools can be quite large. However, these fish can be extremely spooky in water that shallow. Also, angling pressure is high as this is a very popular way to target redfish. Low incoming tides are best as they will concentrate reds on the edges of flats. They will wait for the tide to come up scatter over the bar and feed. Fishing in very shallow water can be tricky, especially if grass is present. Presenting a lure or live bait effectively requires lures that are either weedless, floats on the surface, or runs very shallow. Weedless spoons are great baits and can be cast a long way, seldom hang up, and cover a lot of water. Plugs can also be effective; either shallow diving plugs in deeper water or top water plugs in very shallow water. Live bait can be used on the flats as well, particularly a large live shrimp. Reds will stage in potholes. These are depressions in the flats that are a bit deeper than the surrounding grass. Shrimp can be hooked with no weight, a small split shot, or fished under a float. Redfish are also targeted by anglers fishing with live shrimp under docks. This is really as simple as it sounds, though there are some nuances involved, as in all fishing. Anglers should anchor upwind and up tide a decent cast away from the dock to be finished. The best docks are usually in 4 feet to 10 feet of water. Live bait fish can also be used successfully. Spotted sea trout, known locally as speckled trout, are perhaps the most popular fish along the entire Gulf Coast. Abundant, available year-round, aggressive, and great eating, it is no wonder that they are such a desirable species! While trout are very good to eat it is very important to release the larger female fish these are breeders and crucial to the health of the fishery. Trout school up in decent numbers on the deep grass flats throughout the area. Submerged grass beds and 4 feet to 10 feet of water will hold bait which in turn attracts the trout and other species. A time proven technique on the best Sarasota fishing charter is to use a shrimp under a popping cork while drifting the flat. This ring has accounted for many trout over the years. Artificial lures also fool plenty of trout and are very easy to use. There is also no bait to purchase, catch, or keep alive. The most popular lure by far here in Sarasota is the jig and grub combination. A quarter ounce jig head with a 3 inch to 4 inch plastic trailer is deadly on a variety of species but speckled trout in particular. Bass Assassin 4 inch Sea Shad baits in glow, new penny, and red, are extremely effective. Wind and tide are the major considerations when drifting the deep grass flats for speckled trout. As the boat drifts to call across the grass, anglers cast out lures and flies seeking a school of feeding fish. These are large areas and a little breeze helps to cover the water in a reasonable amount of time. Obviously, too much wind will make it difficult to finish. Generally speaking, 6 foot to 8 foot deep is the target depth. At times, Capt. Jim will anchor the boat on the edge of a grass flat and free line a live bait out. Spanish mackerel are a terrific and often overlooked game fish! They fight hard, make blistering runs, are aggressive, and taste great when eaten right away. They readily take live bait lures and flies. What more can an angler ask for? Spanish mackerel show up in the spring when the water temperature hits the upper 60s in degrees. They will stay around until late fall when it gets cold. They are caught both inshore and in the Gulf of Mexico. Mackerel are often an unexpected surprise for anglers drifting the deep grass flats. Sometimes they can be seen feeding on the surface, but most of the time they will intercept the jig plug, shrimp, or bait fish intended for trout or other species. Spanish mackerel can be targeted in the spring and the fall and both passes when they move in. Again, at times they will feed on the surface and that makes them easy to locate. Drifting with a shrimp works well, too. Trolling a #8 Rapala X-Rap in white or olive is a good way to search for schools of mackerel. Anglers targeting Spanish mackerel will do well to fish the inshore Gulf of Mexico. In the spring and fall they will school up in huge numbers and can be seen working on the surface. Anglers can look for birds, feeding fish, and schools of bait. Casting lures and flies to feeding fish is very exciting! Trolling is another productive method in the Gulf of Mexico. It works well on days with a little chop or when the fish are not feeding on the surface. Pompano are prized among both local and visiting anglers both for their tenacious fight and their incredible flavor on a dinner plate. They are caught in the passes, out on the beaches, and on the grass flats in Sarasota Bay. The best bet for anglers targeting pompano is to drift Big Sarasota Pass using a small pompano jig. This is a basic jig with a round head and a little dressing. Banana style jigs are also effective. Pompano have small mouth and feed on the bottom. Pompano are caught by anglers casting jigs and live shrimp as they drift the grass flats as well. Sometimes pompano will be seen skipping on the surface as the boat idles by. This is a sure sign that there are more in the area. Anglers fishing the surf will do well with jigs and shrimp, but the real pompano surf experts will use sand fleas. Sand fleas, also known as mole crabs, are great for pompano. Sand fleas are caught in the surf using special rakes and then hooked on a small number two or number four hook in a little bit of weight. Mangrove snapper are another extremely popular species for both their battle and their table fare. Snapper are available all year round near structure such as docks, bridges, submerged rocks, and ledges. Live shrimp fished on the bottom with just enough weight to get down there is the best bet. Smaller hooks and light leaders are often required as snapper can be a bit spooky especially in clear water. The inshore artificial reefs off of Lido Key are great spots to bottom fish when it is calm in the Gulf of Mexico. Mangrove snapper have been showing up on the grass flats over the last several years and good numbers with some very nice fish mixed in. July, August, and September have been the best months. Chumming with pilchards is the best technique to catch snapper on the grass. Handfuls of live or fresh dead bait is tossed out behind the boat on a deep patch of grass. This will get them excited and fired up behind the boat. Going small on the hook and light on the leader will result in more fish. Of course trout, mackerel, grouper, ladyfish, and other species will be caught as well. 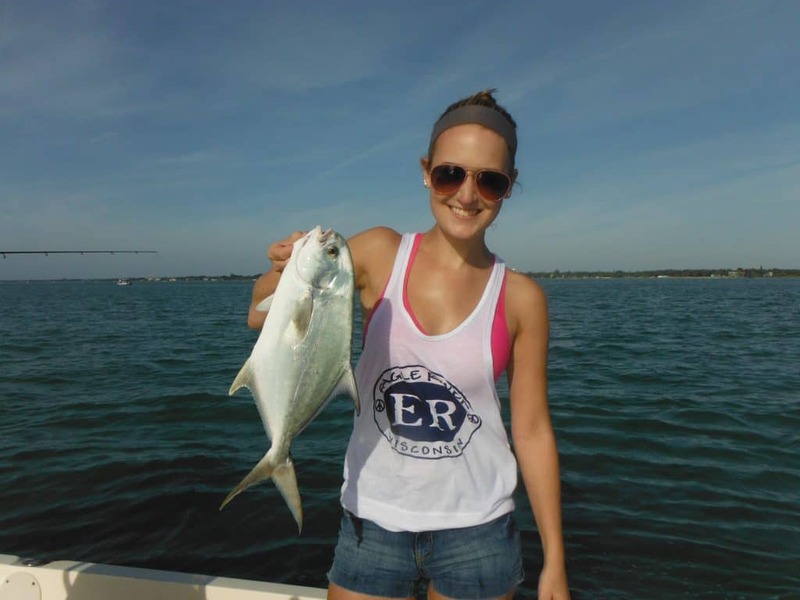 Bluefish are known to many anglers visiting Sarasota as they range up the entire East Coast of the country. They do not grow as large here, 5 pounds is a very nice bluefish, but since most are caught using light tackle they are great fun to catch. They need to be handled correctly and eaten fresh, but they are underrated as table fare. Like many species here, they are caught by anglers drifting the deep grass flats as well as the passes. Jigs work very well for bluefish and when they cut you off, which they will, your only out a dollar or so. Plugs work very well but can get expensive and they are also tricky to release with a bunch of trouble hooks. Live bait works well and a long shank hook were reduced cutoffs. Bluefish will be caught in the passes especially in the cooler months. Jigs bounced on the bottom along with spoons and live bait will work. Sometimes bluefish will be caught by surf anglers on the beach as well. 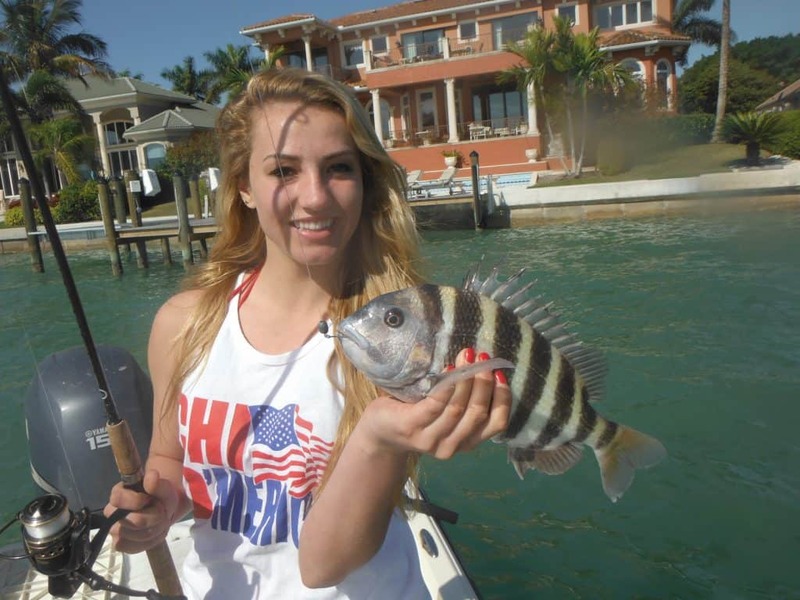 Sheepshead invade Sarasota each year around Christmas and stay around until late spring. These tasty members of the Porgy family are structure oriented and can be found near anything the provides cover and has barnacles. Bridges and docks are prime spots as our seawalls, ledges, submerged rocks, and artificial reefs. Sheepshead are rarely caught on lures, live or frozen bait is required. Shrimp, fiddler crabs, and sand fleas, will work live fresh dead or frozen. Sheepshead are notorious for being great bait stealers. They bite very lightly and anglers need to be patient and be still an order to catch them. Small hooks rigged up on a short leader with a sliding sinker is the best rate. The sheepshead will be able to pick up the bait and move off without feeling any weight. Sheepshead are great eating but very difficult to clean. The inshore artificial reefs off of Lido Key are great spots to target sheepshead on nice days. Jack crevelle are a terrific game fish! Jacks are like bluegill on steroids, they turn their broadsides and just pull as hard as they can. Jacks school up and can be voracious at times, devouring anything that moves. They can also be fussy. Jacks are found throughout the area and just about every portion of Sarasota Bay. In the cooler months jacks are found in backwaters, residential canals, creeks, and area rivers. Live shrimp will work, but fast-moving lures like plugs are more fun and elicit violence strikes. As it warms up, jacks move into the bays to feed. By summer they can be anywhere or nowhere. Anglers land them drifting the deep grass along with other species. The area south of Siesta Drive in Roberts Bay is a good area for jack crevelle. Docks seawalls, canals, and Phillippi Creek are prime spots that attract fish. Jacks will grow to 10 pounds. 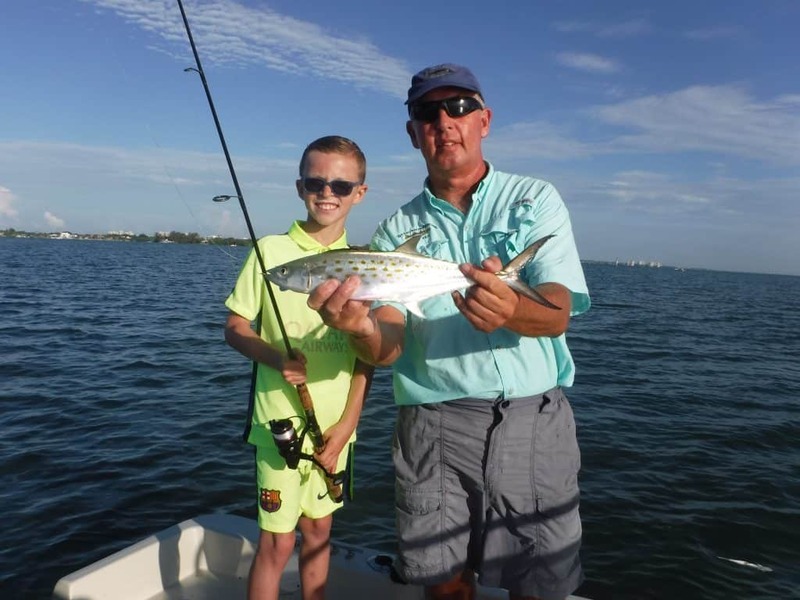 Ladyfish have saved the day on many charters in Sarasota, despite the fact that they are sometimes disparaged by local anglers. While not good to eat, they are abundant aggressive, hit lures, baits, and flies, leap high out of the water, and fight very hard for their size. In the cooler months they school up in very large numbers and multiple hookups are the norm. They are caught in the passes out on the beach, and on the deep grass flats. Ladyfish will certainly take live shrimp and pilchards, but they are much more fun to catch on lures. This is a great opportunity to teach kids to use jigs and other lures as a bites are frequent and easy to feel. A jig and grub combo is tough to be and color rarely matters. Fly anglers can have great fun with ladyfish as well. It is a great opportunity for the novice fly angler to get in some practice and build confidence. Ladyfish are excellent cut bait for sharks and other species. 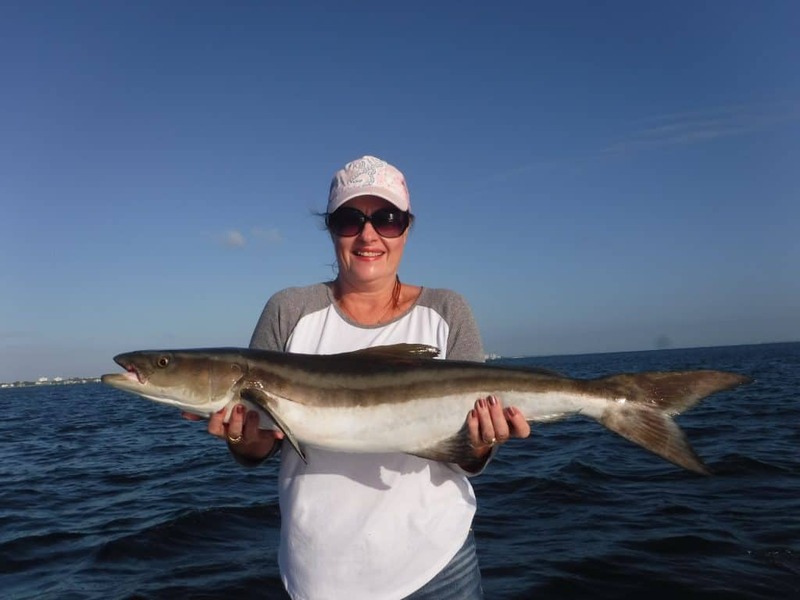 Cobia are normally caught out in the Gulf of Mexico but they do move into Sarasota Bay. They are an incidental catch on the flats and passes and will hit the same lures and baits that produce all of the other inshore species. They are often seen just cruising under the surface and are mistaken for sharks. Prepare for a long battle on trout tackle. They are terrific eating but need to be 33 inches to the fork. 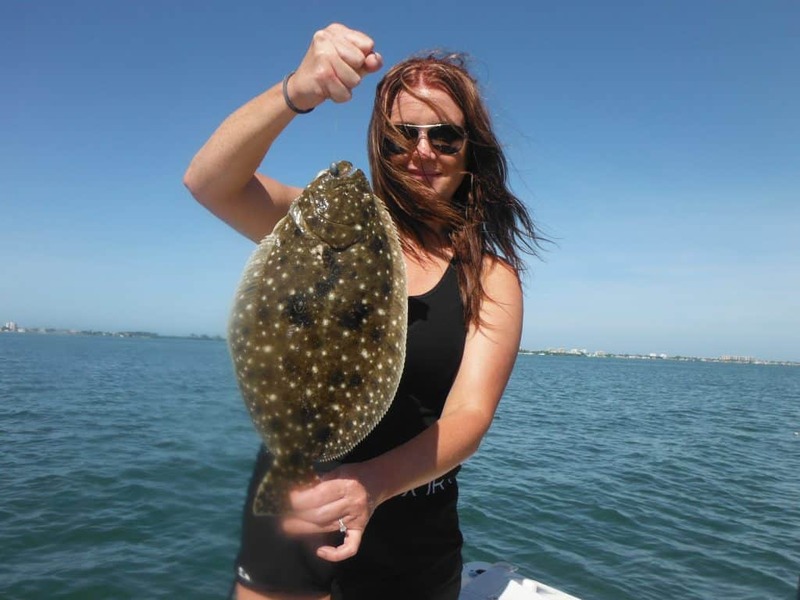 Flounder are a delicious bottom fish that are well known and prized by anglers everywhere. Most of the flounder in Sarasota are southern golf flounder. Though we really don’t have a population large enough to target they are caught occasionally by anglers fishing for other species. Structure such as docks and bridges along with deeper holes in the grass flats are good spots to try for flounder jigs, live bait, and cut bait all produce. Flounder do school up occasionally on the inshore artificial reefs. 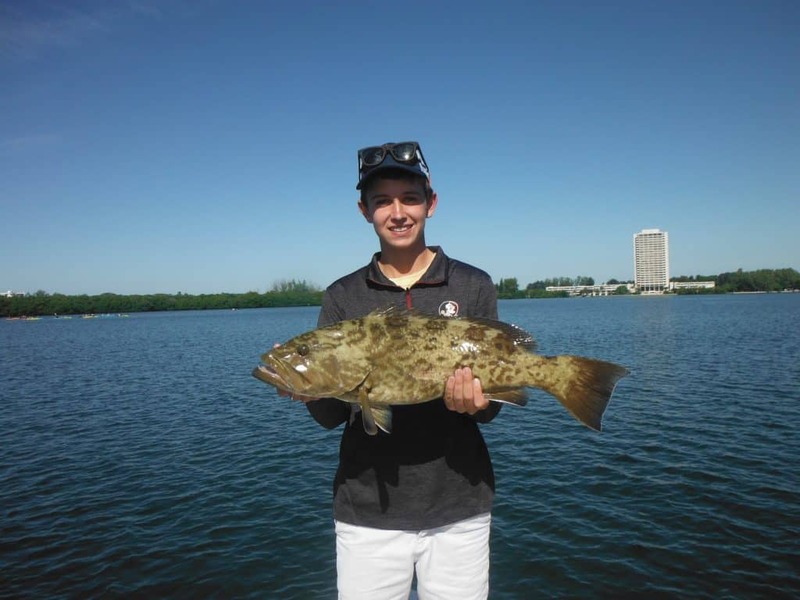 Gag grouper are arguably the most popular and prized offshore species in Sarasota. Most of the grouper that are caught inshore are juveniles that will migrate out into the Gulf of Mexico, where they will grow to full maturity. Legal grouper are seldom caught in Sarasota Bay, though some anglers target them by trolling large plugs and bottom fishing with heavy tackle and large baits. Area bridges are the top spots for larger grouper. Anglers on a best Sarasota fishing charter may land grouper when Sheepshead fishing in the spring and on the deep grass flats in mid to late summer. 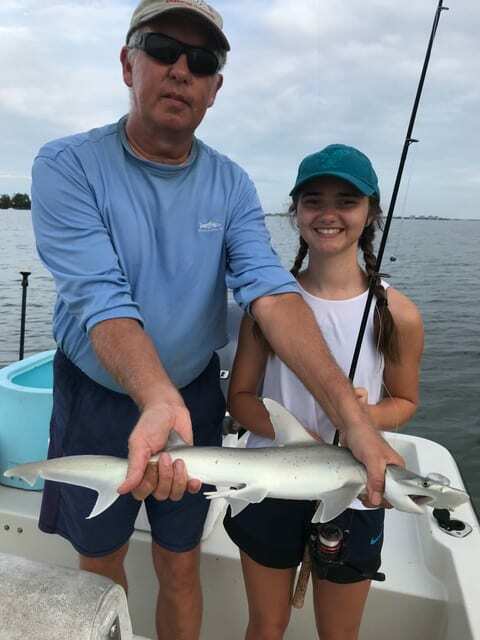 Small sharks are great fun to catch and always a crowd favorite, especially for the young anglers! Most are caught incidentally; they will hit jigs and live bait. In the late summer they can be targeted using cut ladyfish on the flats. They are usually plentiful in the inshore Gulf in the spring and again in the fall as they feed on schools of Spanish mackerel. 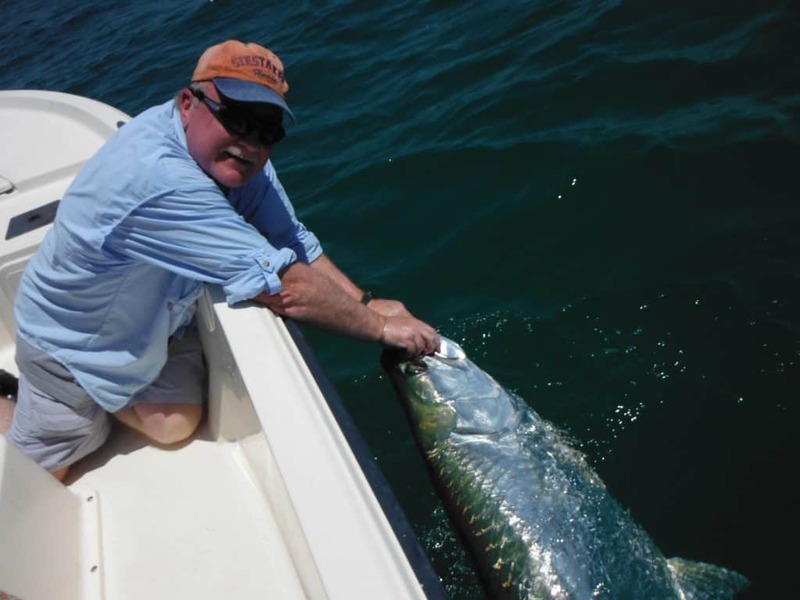 Many anglers consider tarpon to be the ultimate fishing challenge. There are few opportunities to sight cast to fish well over 100 pounds using fairly light spinning tackle. Tarpon fishing is very specialized however, and not for everyone. It is much like deer hunting, there will be a lot of time spent looking and waiting. But, when it all comes together, there is nothing like it! Tarpon show up in schools off of the Sarasota Beaches in early May and stay until mid July. Most tarpon are caught using small live crabs or hand sized bait fish, however large plugs will fool tarpon as will a well-placed fly. False albacore make a run along the Gulf Coast in the spring and again in the fall. They are following the large schools of bait fish upon which they feed. False albacore are caught off of the Sarasota Beaches up to 12 pounds. They put up a tremendous fight and a reel with the quality drag is required to catch them. Most are caught sight fishing as they feed actively on the surface. This adds to the excitement of targeting false albacore as the action can be fast and furious. Small lures such as spoons, plugs, and jigs are most often used, as the bait they are feeding on is quite small, usually glass minnows. This is a great opportunity for a fly angler to experience world-class action! Capt. Jim offers visiting anglers a unique experience; fishing local area rivers. Adventure charters is the only operation offering such a trip. A smaller 14 foot Alumacraft John boat is used for these charters. Launching areas can be primitive and the water can be very shallow and spots thus the need for a light, shallow draft boat. The venerable John boat is perfect for this! The Myakka River, Braden River, and Manatee River, all lie a short drive from Sarasota and her beaches. All three are unique and have their pros and cons. The Braden River is the most developed, however offers very consistent fishing for large jack crevelle. Snook, redfish, and other species are caught on most charters. 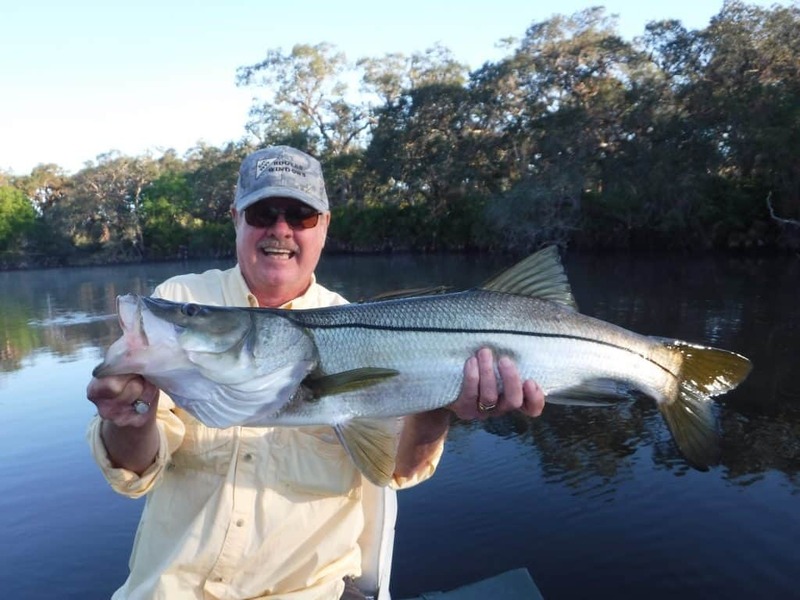 The Myakka River in Venice Florida, offers the best trophy snook fishing. The Myakka River is a wild and scenic river and also has a distinct feel to it. It is almost like being on a South American River! The Manatee River is a bit of a mixture of the two, with some development, but also some very nice stretches. The Manatee River also offers the most variety in terms of species. River fishing charters are best suited for anglers with a bit more experience. They do not produce as much action as do the inshore bay fishing charters. However, for anglers seeking a bit more challenge, the reward can be a trophy snook of a lifetime! Snook to 40 inches and 20 pounds are not uncommon. It is important to cover as much water as possible, therefore we drift with the current and cast rapidly plugs and other lures to likely looking shoreline cover. Snook, largemouth bass, jack crevelle, redfish, snapper, juvenile tarpon, catfish, gar, and sunshine bass are all available depending on the conditions. Q: What is the cost of a Sarasota fishing charter and what does it include? A: A four hour fishing charter for up to four anglers is $400. That cost covers all bait, tackle, licenses, the boat, and capt Jim’s service and experience. Spinning tackle is used on most charters as it is the best choice for our type of fishing. Live shrimp and live bait fish are used along with artificial lures. A cooler with ice is provided for clients to keep their drinks and snacks cold. More information can be found HERE. Q: What do clients going out on a Sarasota fishing charter need to bring? A: Clients should bring along whatever they want to eat and drink, hats, sunglasses, and sun screen. Guests should wear boat or tennis shoes with white soles. Everything else for the fishing charter is provided. Anglers may bring along their own tackle if desired, though quality Penn and Shimano tackle is provided. Fly anglers can use Orvis tackle provided by Capt Jim or certainly provide their own outfits if they prefer. Q: Are clients on a Sarasota fishing charter allowed to keep fish to eat? A: Yes. Anglers may keep a few quality fish that are good to eat, in season, and meet the legal size requirements. Capt Jim will fillet the fish and bag them up at the end of the charter. Capt Jim does promote catch and release to insure the health of the fishery. The fishing charter is about having fun and making memories, so keeping fish is a bonus and not the focus of the trip. Q: What kind of fish do clients on a Sarasota fishing charter catch? A: Sarasota Bay is a diverse fishery, offering anglers the opportunity to catch many different species. Speckled trout, Spanish mackerel, bluefish, pompano, ladyfish, sharks, and other species are caught on the grass flats. Snook, redfish, and jack crevelle are caught by more experienced anglers along mangrove shore lines. Structure in the passes as well as docks and bridges hold sheepshead, snapper, grouper, and flounder. Current species identification and regulations can be found HERE. Q: Where will clients meet Capt Jim and at what time? A: The time will be determined by the weather, conditions, and tides. Most fishing charters are run in the morning as that is usually the most reliable fishing. Afternoons can be better in the winter as it warms up later in the day. Most charters will leave around 7:30 a.m. Most charters will leave from Centennial Park in downtown Sarasota, Florida. HERE is a link with a map and the address. That ramp is in a very good location for accessing the fishing grounds and eliminating the slow speed zones. Q: What is the best time of year to go out on a Sarasota fishing charter? A: Fishing is good all year long, depending on conditions. Summer offers very reliable action, though it is an early bite. Spring is good as long as the weather is nice, though boat traffic is the heaviest. Fall is fantastic, great weather and no crowds. Winter can be very good, but weather fronts are an issue. Anglers can check out my monthly forecasts HERE to help plan their trip. Q: Who offers the best Sarasota fishing charter? 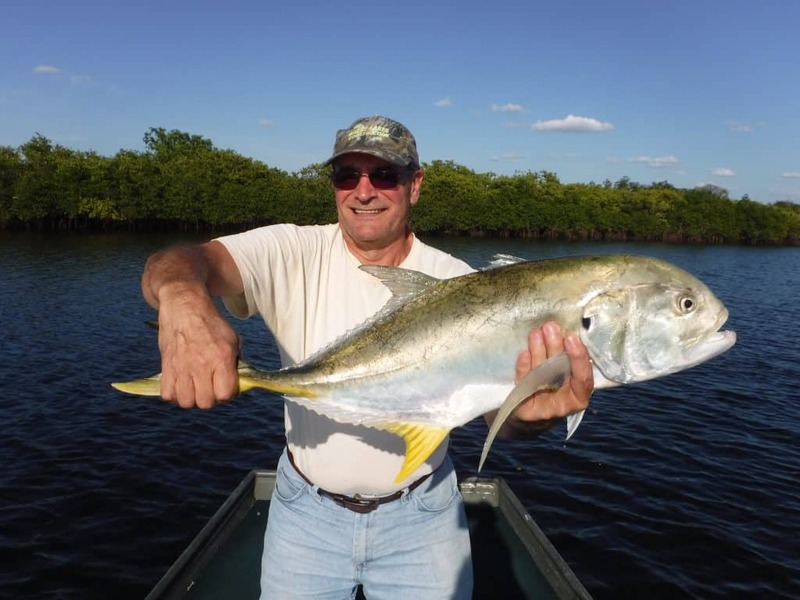 A: With respect to the other fine fishing guides in Sarasota, nobody works harder than Capt Jim Klopfer for his clients. He is easy-going and personable, patient with children, and fun. Capt Jim will use whatever baits and techniques needed to give clients the best chance for success. He often fishes with several different lures and baits on a single four hour charter.